Thanks to working late into the evenings every day for eight LONG weeks at my day job a couple of months ago, I’m running behind on releasing my current work in progress. However, at long last, I’m nearing the final weeks of writing PROVING GROUNDS, which is Book Two of the London Carter mystery series, and I expect it to be released mid-February. To those of you who have waited patiently–and even those who have waited not-so-patiently–I am truly sorry for the delay, but thankful for your interest in my work. I hope you will find that it was worth the wait. 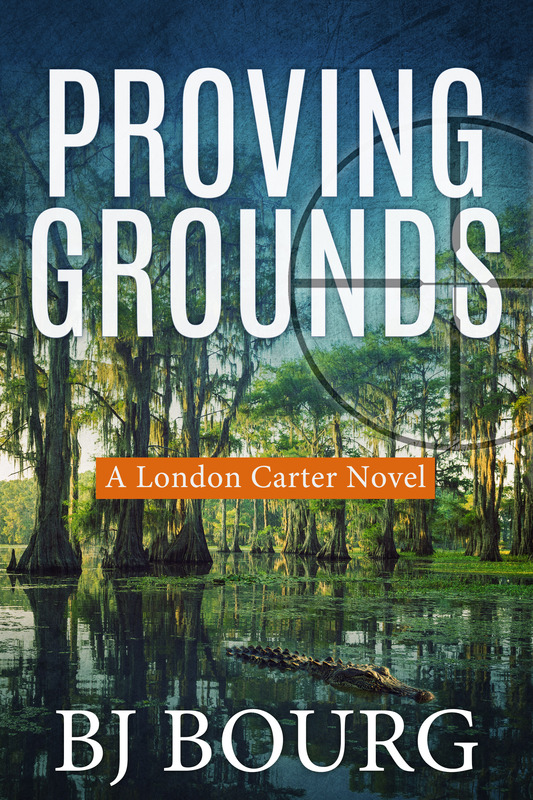 In PROVING GROUNDS, London Carter will join forces with Dawn Luke, whom you might remember from the Magnolia Parish series, to investigate the sniper-style murder of an alligator poacher. While investigators are unsure of the killer’s motive, members of the victim’s family believe a rival clan is responsible for the murder, and the two sides prepare for battle. Will London and Dawn find the murderous sniper and stop the war, or will the swamps of Louisiana run red with the blood of dozens of innocent people? In closing, I want to thank each and every one of you for your support. Because of y’all, I’ve just reached a milestone in my young writing career: over 10,000 eBooks sold since March 31, 2016. I would have a drink to celebrate, but it’s past midnight and I have work in the morning. Thus, I’ll just have one last handful of Sno-Caps and call it a night. …the CLINT WOLF MYSTERY TRILOGY: BOXED SET has become an Amazon best-seller! Today alone it has sold nearly 3400 copies (and counting), and I cannot thank all of you enough! Furthermore, for a limited time, the Boxed Set is available for $0.99. That’s three full-length books, which consists of over 245,000 words and nearly 800 pages of mystery, suspense, and romance, combined into one tight electronic package for a steal of a deal. Embattled former detective Clint Wolf is the newly appointed police chief for Mechant Loup, a small swampy town in southeast Louisiana. Usually a quiet town, the tranquility of the place is shattered when a human arm is found in the jowls of an alligator. Once it’s determined the arm belongs to a reputable business owner, the race is on to find the man and figure out what happened to him. Little does Clint know that solving the case could unearth a plot so evil it would go down as the worst event in Louisiana history . . . and he might not live to see it. When a woman is found dead on her doorsteps—shot through the heart with an arrow—Clint Wolf and Susan Wilson go to work trying to track down the sadistic killer. On the very next day, a second victim is murdered in his driveway (killed in the same manner) and it’s now a race against time to uncover the motive behind the killings and identify the murderer. What they know so far is that he’s a skilled archer preying on human targets, and they have no clue where he’ll strike next. As though the case itself isn’t complicated enough, the district attorney has launched a grand jury investigation into Susan’s actions during a shooting that saved Clint’s life. No one knows exactly why the DA is gunning for Susan, but one thing is crystal clear . . . it’s personal. No one knows why the district attorney is gunning for Susan Wilson, but Clint Wolf is determined to find out—even if it’ll get him in trouble. While he works to clear Susan’s name, his crusade is sidelined when a bar manager is murdered during an apparent armed robbery. The method of operation is eerily similar to those used by the ruthless gang who killed his family, and Clint might soon have to face down the demons from his past to solve the mystery. Will Clint walk that fine line between good and evil, or will he abandon his principles to settle an old score? Whatever choice he makes, one thing is certain . . . it’ll come at a hefty price. Thanks again to all of you for making this book such a hit!